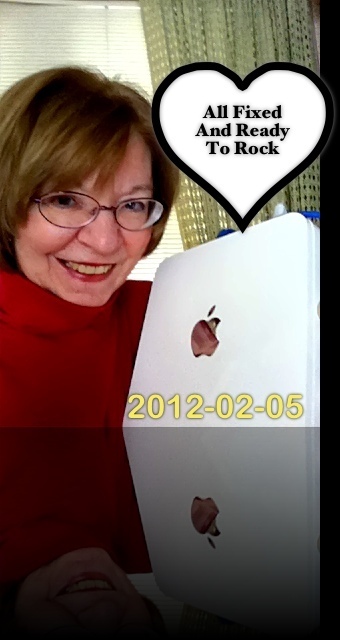 Posted on February 5, 2012, in Apple, Apple Products, External Storage, Technology and tagged Time Capsule, Time Machine. Bookmark the permalink. 16 Comments. Well… I was ready to follow the same instructions and put it on Bridge Mode, when I clicked on the base station icon in the Airport utility and read it’s “summary”. That side dialogue box showed that my Apple ID wasn’t correct. So before I changed any setting, I just decided to enter my correct Apple ID and password. VOILA!! The same solid green evoking nature, money and all good things, fired up on my base station and subsequently on my Airport Utility window. Oh! The joy of green! So, just wanted to share this also possible solution for the annoying amber light. Phil – thank you so much. Another solution! Yay! I never thought of that. Is your Time Capsule connected to your regular router as well? I couldn’t use bridge mode…. but loved your story! Our Telus Optik TV commands total control over our router… Telus router… and I was told by our Telus techie that our TC needed to be ethernetly sp? connected to our Telus router, and bridge mode was not an option. Same as Above – yes bridge mode is tricky. And truth be told, since I wrote this article, I have had two issues with TC working properly. I did get it going again but will probably have someone look it over after the holidays. content to suit your needs? I wouldn’t mind composing a post or elaborating on some of the subjects you write related to here. Again, awesome site! “It could suffered those UUSee adjustable certain revenue have been type, to ascertain a varied structure, in adition to craigslist ad income, augment treasure-introduced active options, Huge Web coffeehouse provider alongside the lines. On the main section from the search engine, you can look for movie files, music files, and also other types of files quickly from file sharing sites across the World Wide Web. Therefore the app sits somewhere between a really useful app plus much more of a novelty. you knew where I could locate a capthha ppugin for my comment form? I’m using the same blog platform as yours and I’m having difficulty fiknding one? All you want is a working pc, an web connection, and a consumer identify and password to register. alone time with a few great movies. only because it sounds just right is a big no. Business and that is what we promised you our e-book would supply. It will be helpful for individuals who are already employed for his or her career improvement.